Clara's Fruit Cake Put in foil, stores pour wine over after done pour white wine over cakes 2 cup sugar Gran - 3/4 # Butter creamed. 10 eggs beaten light. 4 cup Flour sifted- 1 level teaspoon B.P. 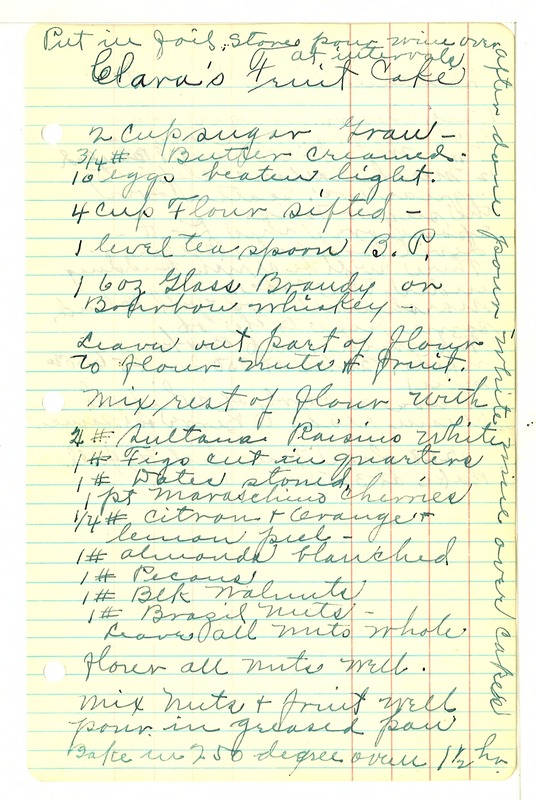 1 6 oz Glass Brandy or Bourbon whiskey Leave out part of flour to flour nuts & fruit. Mix rest of flour with 4# sultana Raisins white 1# Figs cut in quarters 1# Dates stoned 1 pt maraschino cherries 1/4# citron & orange & lemon peel - 1# almonds blanched 1# Pecans 1 Blk walnuts 1# Brazil nuts - Leave all nuts whole. Flour all nuts well. Mix nuts & fruit well pour in greased pan Bake in 250 degree oven 1 1/2 hr.